Over the past week or so the UK’s biggest and best festivals have started to reveal a few more names to bolster the festival lineups. Some festivals revealed whole lineups, while some announced a major name or two. Here’s a quick debrief all in one place in case you missed anything. With the headliners already announced, R&L finally bolstered their lineup with an additional 50 acts along with the announcement of which artists are on what stage. Sub-headliners were announced as well as the second stage headliners. This writer isn’t all that pleased with it: Royal Blood, Blossoms and A Day To Remember aren’t worthy of their slots in my opinion. The best part of this latest announcement is without question the area that R&L traditionalists will hate, the rap and RnB. Joji, Lil Uzi Vert and Anderson .Paak are all fantastic announcements for the main stage. Charli XCX and Mura Masa are quality announcements as well, especially with new albums looming in the distance. 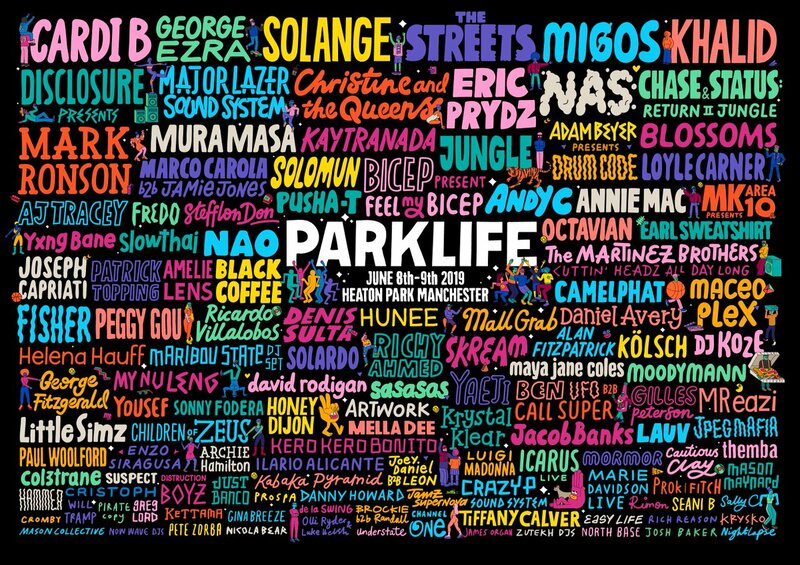 Parklife came out with a monster announcement of headliners and much more. As predicted in a previous article, The Streets are heading to the festival, but in a bizarre turn of events they aren’t headlining; Parklife feel that George Ezra is more qualified. While they’ve not managed to top their previous efforts of Frank Ocean and The 1975, it’s still a great lineup. There’s something for everyone this year, from JPEGMAFIA to Bicep to Blossoms to Migos. I’m a huge fan of the depth, particularly in the rap names. A big selling point is the strong presence of big name women: Cardi B and Solange headlining along with Christine and the Queens set to get a big spot on the bill. Wireless is without question the biggest rap festival in the UK, and once again they’ve knocked it out of the park. Headline acts of Cardi B, A$AP Rocky and Travis Scott instantly make it a smash hit for any fan of the US rap scene as well as sub headliners Migos, Future and Rae Sremmurd. On the UK side of things we’ve got the red hot Unknown T along with AJ Tracey, Steflon Don and Bugzy Malone. There’s something out there for every fan of this genre. Young Thug and Sheck Wes being 4th and 8th on the bill respectively tells you just how stacked this is. All Points East have made some monstrous announcements. The Strokes headlining is one of the biggest coups of the festival season, they’re band that could headline whatever festival they want whenever they wanted to. The addition of James Blake and Kamasi Washington are also welcome ones. But that’s just the first weekend. The second weekend of the festival takes place the following week, with headliners of Bring Me The Horizon and Bon Iver, as well as a massive set from Run The Jewels. All in all this might be one of the best lineups from the lesser known festivals in the UK. This is as far from an enjoyable festival I could imagine, for me anyway. It feels someone has made a tin pot Dark Fruits lineup and forgotten some of the big names. For a festival that’s had Arcade Fire, Blur and Fleetwood Mac in previous years, this is a step down without question. Don’t get me wrong, there’s a few names that spark my interest, but all in all this is a woeful attempt. That’s the debrief over, we’ll be sure to keep you all updated on any more announcements, and hopefully this has helped you make your mind up on which festival(s) you want to see.